Gabrielle de Coignard, "Spiritual Sonnets: A Bilingual Edition (The Other Voice in Early Modern Europe)"
Born into a wealthy family in Toulouse, Gabrielle de Coignard (ca. 1550-86) married a prominent statesman in 1570. Widowed three years later, with two young daughters to raise, Coignard turned to writing devotional verse to help her cope with her practical and spiritual struggles. 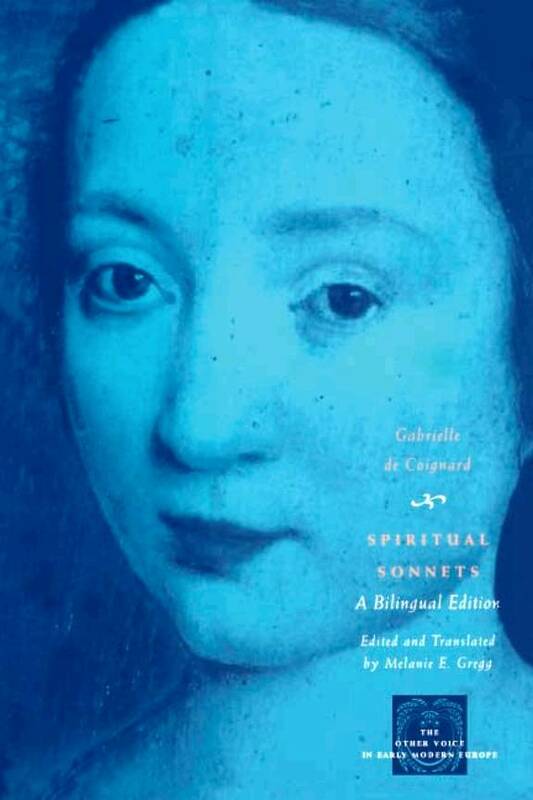 Spiritual Sonnets presents the first English translation of 129 of Coignard's highly autobiographical poems, giving us a startlingly intimate view into the life and mind of this Renaissance woman. The sonnets are all written "in the shadow of the Cross" and include elegies, penitential lyrics, Biblical meditations, and more. Rich with emotion, Coignard's poems reveal anguished moments of loneliness and grief as well as ecstatic experiences of mystical union. They also reveal her mastery of sixteenth-century literary conventions and spiritual traditions. This edition, printed in bilingual format with Melanie E. Gregg's translations facing the French originals, will be welcomed by teachers and students of poetry, French literature, women's studies, and religious and Renaissance studies. "The translations flow fluently and bring these poems to non-Francophone readers."